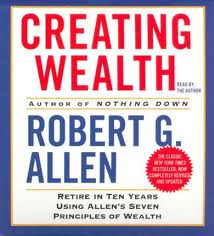 The book of the week was Creating Wealth by Robert Allen. I was skeptical of this book at first because Allen is also the author of a book called Nothing Down. And I was a bit cynical of anyone that would promote his readers taking on the risk with getting a property for 'nothing down.' And... I was completely wrong, Allen is brilliant. I have not read Nothing Down yet, but I certainly intend to after all the knowledge I acquired while reading this book. So far I have had a range of real estate risk that ranged from buying one property a year, being the most risky, to slowly purchasing properties throughout your life, this would be the least risky. Allen opened my eyes to a whole new type of real estate investing. It's nothing revolutionary, but it sounds very doable after reading this book. The strategy involves buying two properties a year. And doing this for ten years. The concept I liked about his pitch is what you do at the end of the ten years... sell the first ten houses you purchased and pay off the mortgages on the second ten you purchased. At this point you will have ten cashflowing properties that you own with zero debt. I really like that idea! Another idea that Allen discussed was diversification. Until now I have been a big advocate of diversifying investments, however, after reading this book it doesn't seem like diversifying is universal at all times in an investor's life. If you give someone a hundred dollars to invest, should you expect them to split it between a few different investments? Probably not. How about a thousand dollars? What is the right amount of money that requires diversifying? Andrew Carnegie was quoted saying "Put all your eggs in one basket, and watch that basket." When you are in the early stages of investing to make wealth it is important to maximize your return on investment. After you have accumulated some wealth you should start to diversify, but if it's done too early you may never make it to becoming wealthy. I am reminded of one of the Rich Dad Poor Dad books... Robert Kiyosaki writes about a lesson he learned from his rich dad, he said that if you think a million dollars is a lot of money you will never be a millionaire because you will not risk the money required to become a millionaire. When you are investing your dollars, at what point should you start moving your eggs into different baskets? I can't set this number for you... But it is something you should give some thought. I liked this book. It was really well written and very detailed. I feel very confident I can go out and purchase two houses a year and do it well. As always, if you have any questions on the book don't hesitate to ask. I would be more than happy to help anyone that wants it. 45 Effective Ways for Hiring Smart!